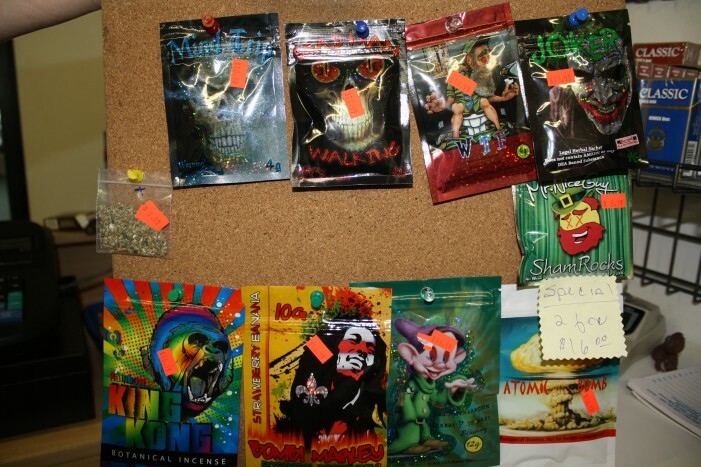 Evidence photo of the Synthetic Marijuana on display for sale. Citrus County, Florida — After a year of investigations, detectives with the Citrus County Sheriff’s Office Tactical Impact Unit along with agents from FDLE launched search warrants in three smoke shops Thursday which have been selling illegal synthetic cannabis (commonly known as Spice or K2). Happy Timez Tobacco Shop in Inverness, Blowin’ Smoke in Hernando, and Funky Groove in Crystal River actively sell this drug, and have been previously warned and made aware of the legal ramifications if they continued to sell it. As a result of the operation, 2,170 packages of synthetic cannabis were confiscated. The street value of these drugs ranges from $32,500 to approximately $42,500 when sold at regular retail price for $15 to $25 a package. Some of these illegal substances sell for $35 – $50 a package. $10,718 was also seized from all three stores combined. 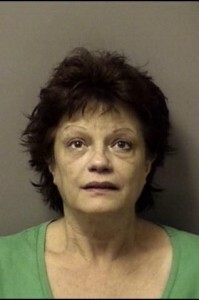 Vicki Macko, 54, owner of Blowin’ Smoke in Hernando, was arrested on two counts of sale of a controlled substance. The Citrus County Sheriff’s Office will continue to pursue charges on the store owners and clerks who sold unlawful substances and had knowledge that what they were selling was illegal. After conducting interviews detectives will be following up with arrests when the FDLE confirms the substances which were taken from the stores during the operation were truly outlawed substances. Synthetic cannabis has been designated by the Legislator of the State of Florida, Senate Bill 294, as a Schedule I controlled substance effective December 11, 2012 and updated to include newly identified synthetic chemical substances on April 24, 2013. The Citrus County Sheriff’s Office is working on a county ordinance to “outlaw” the sales of these chemicals in Citrus County. Several surrounding counties have had success with the county ordinance. However, it may still possibly be sold underground. The Citrus County Sheriff’s Office will continue their partnership with the Anti-Drug Coalition of Citrus County in an effort to educate store owners and the public of the harmful effects of the synthetic products. Through the campaign which started in September 2012, the Sheriff’s Office has been able to convince the majority of convenience stores in the county to voluntarily stop selling the products. Synthetic cannabinoids are derived from chemical compounds that are related to the basic structure of the THC (Tetrahydrocannabinol), which is the primary active chemical in cannabis (marijuana). The problem is that the manufacturers of these chemicals have changed the chemical compound to add a carbon molecule or other chemicals which alters the chemical structure. Therefore resulting in an unknown synthetic substance that has similar properties to cannabis with other side effects such as hallucinations, anxiety, euphoria, and mind altering episodes that have not yet been studied.